Barley is really a great salad base. 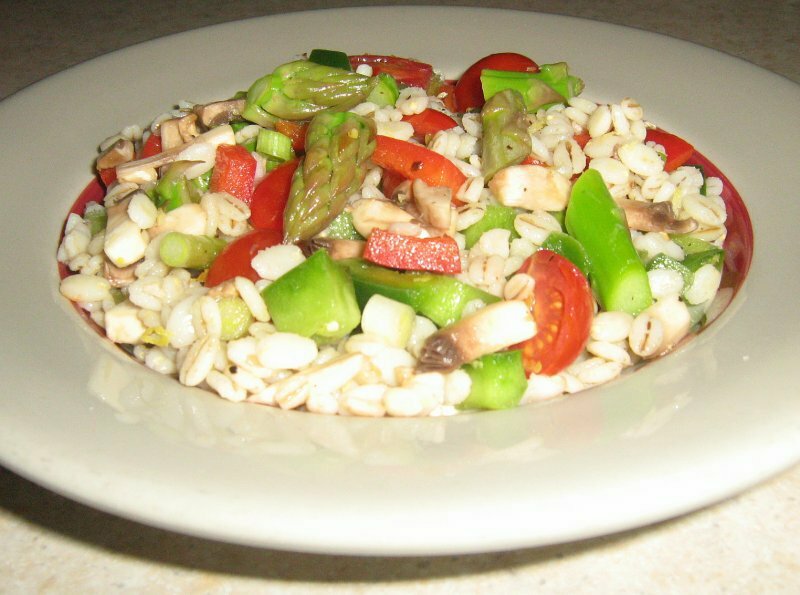 This barley salad primavera is a great way to use it too! Barley provides a good amount of fiber and contains eight essential amino acids. Some studies suggest that eating whole grain barley can regulate blood sugar (i.e. reduce blood glucose response to a meal) for up to 10 hours after consumption compared to white or even whole-grain wheat, which has a similar glycemic index. Whatever the experts say, we say it's a delicious way to construct a salad like barley salad primavera or even a hearty soup. And this barley salad is one more verification that color matters! Give it a try! In a medium saucepan, boil the water. Stir in the barley, reduce heat to simmer, cover, and cook until barley is tender, about 10 - 12 minutes. Drain in colander, then rinse barley under cool water and drain well. Place barley in mixing bowl. Place the asparagus in boiling water for 3 to 4 minutes. Drain and immediately plunge it into a bowl of ice water to stop the cooking and keep it crisp-tender. Drain well and add to barley. Add tomatoes, onions and mushrooms. Grate or zest 1/2 the lemon into the barley and add the diced peppers. For a nice light dressing, squeeze 1 to 1 1/2 tablespoons of juice from the lemon into a small bowl. Mix in salt until it dissolves. Add 4-5 coarse grinds of pepper. Whisk in the oil. Pour the dressing over the salad and toss with a fork to combine. Serve chilled. Makes about 4, 1 cup servings.